Last Friday night, the Twitter airwaves were busy with people sharing their tips for finding female ancestors on #GenChat. Jen Baldwin has compiled many of them into a Storify piece. One question that arose was: how do you find a woman in later records if you don’t know who she married, or where? If you don’t know her married name, you might not be able to find her death record, for example—and death records can be a particularly rich source of information. There’s a little technique I’ve found helpful in some of these situations. It doesn’t work every time, but when it does, it’s a gem. Any online death index (or birth or marriage index, for that matter) that’s searchable by father’s name is a good candidate. 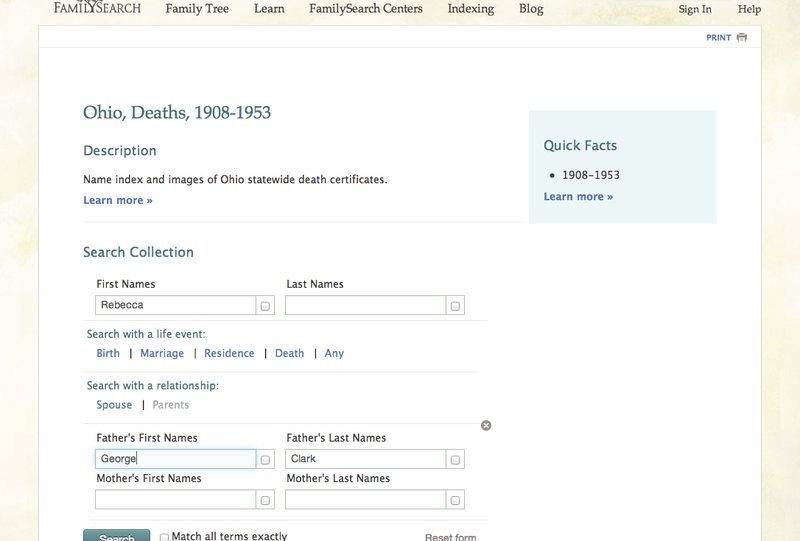 Since I the use “Ohio Deaths, 1908-1953” database on FamilySearch.org constantly, I’ll use that as an example. A few weeks ago I was searching for the death record of Rebecca Clark, daughter of George Clark and Rachel Orr. I had her name and approximate birth date from census records, but lost track of her when she left her father’s household. 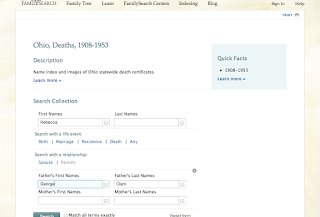 I turned to the “Ohio Deaths” collection on FamilySearch, and entered only her first name, Rebecca, leaving the space for the last name blank. 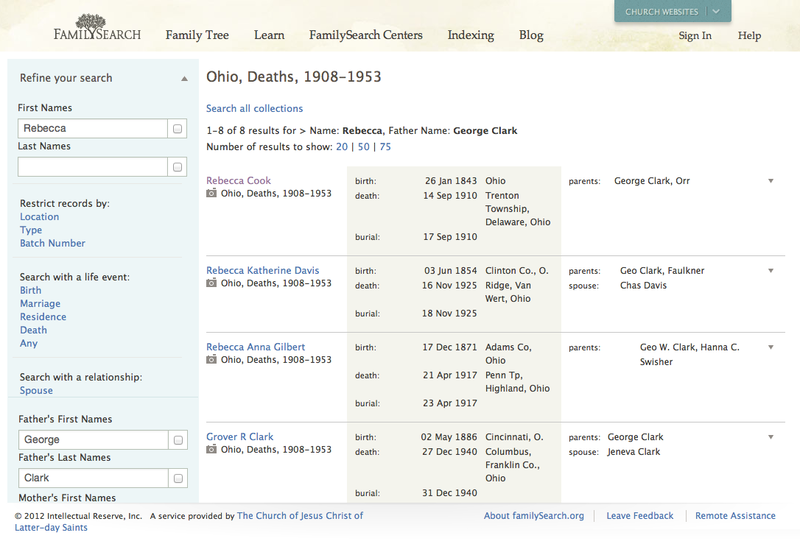 Then I clicked on “Parents” under “Search by a Relationship.” I entered her father’s name, George Clark. I usually don’t enter a mother’s name unless I get too many results. I didn’t enter any geographic information, since I didn’t know where she was living when she died. With that little bit of information—her first name and father’s name—I hit the Search button, and up popped a list of people whose death certificates show George or Geo. Clark as their father. Those named Rebecca were at the top, and the one I was looking for happened to be first on the list. Her married name was Cook, and just like that I discovered her birth and death dates (at least, as they were reported on this record). How easy is that? Now, I admit this is a pretty simple example. You might ask why I didn’t just search for a marriage record—and in this case, Rebecca’s marriage record is also easy to locate. But sometimes you can’t find a marriage record, or a woman marries for a second or third time and becomes difficult to track. This little trick may be just what you need in those cases. The same technique also sometimes reveals a child (male or female) who was born and died between census enumerations, and whose only record is on an old county death register. Many of the county death registers I’ve seen only put the parents’ names if the person who died was young. So if you try it, keep your eye out for an unexpected result. So, just a little tip, a small tool to add to that ever-growing toolbox that each family historian depends on. Another of my favorites is Using Obituaries to Find Married Names. Gena Philibert-Ortega is doing a wonderful series this month on "Researching Your Female Ancestors" on her blog, Gena’s Genealogy, with a different resource featured every day. She’s giving me a lot of new ideas that I hope will help with finding and understanding the women in my family. And Lisa Alzo is encouraging bloggers to share their findings with “Fearless Females: 31 Blogging Prompts to Celebrate Women’s History Month.” What's your favorite? I have had this work for me too! Thanks for the great post. Glad to know you've had success with this too, Cheri. Thanks for reading and taking the time to write a comment! Awesome piece...really great read...thank you for this interesting article...I will bookmark and revisit for more great information. Cheers from Australia. Cheers to you too, Fiona! Thanks for letting me know it helped you--that's what I was hoping for. This is indeed a gem, Shelley. 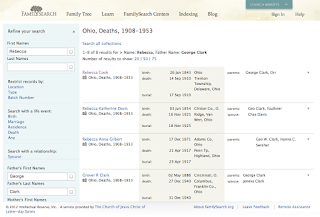 I did not know you could do this on FamilySearch.org! I'll admit I'm not good at FamilySearch.org yet, and I'm sure I need some classes. But just typing in "Parents" under "Search by a Relationship," with the first name of the woman, and without a place, is extremely clever. I've done first-name searches before, and I've tried typing in the father of a married woman for her birth certificate on other (state) databases and come up empty, so I turned away discouraged with this approach. But now I have to get on over to FamilySearch, now, and try your method with death certificates. You've given us a lucid, elegant suggestion. I think you are a calm voice of reason amid the clamor. FamilySearch databases really lend themselves to this kind of technique, Mariann, so I think you'll like the results once you try it. Happy searching!